Ethical Theory and Business 9 Edition An anthology of readings, legal perspectives, and cases in business ethics. 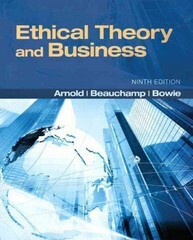 Ethical Theory and Business provides students with a strong understanding of ethics in business. Case studies, a discussion of ethical theory, and a diverse range of perspectives on specific topics give students the tools needed to address ethical situations in business and challenge them to think for themselves. Learning Goals Upon completing this book readers will be able to: Reflect on ethical and sustainable business practices Understand the role of ethics in all function areas of business including management, marketing, international business, human resources, finance, and accounting Discuss the most pressing issues confronting business leaders today Note: MySearchLab does not come automatically packaged with this text. To purchase MySearchLab, please visit: www.mysearchlab.com or you can purchase a ValuePack of the text + MySearchLab (at no additional cost): ValuePack ISBN-10: 0205201199 / ValuePack ISBN-13: 9780205201198.